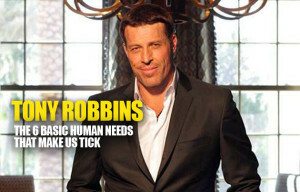 Many of you may have heard of Tony Robbins, the famous life and business strategist. I’m a big fan, in fact I’m not only a fan, I’m also a customer. I have attended numerous Unleash the Power Within (UPW) events and also three of Robbins’ mastery workshop/seminars. My personal favorite is the 7 day Date with Destiny conference and, as the very fact that I’m a repeat customer indicates, I find Tony Robbins’ ideas inspiring and effective. Recently I was pondering about marketing, human nature and my other preoccupations as an entrepreneur and then it popped into my head that everything we marketers can understand is summed in Tony Robbins’ Six Human Needs. Robbins says, that we all want love. We want to love and be loved, but we will also settle for connection if we can’t get love. What is true of us as individuals is also true of each of us as customers. That is why the brands/marketers that understand how to get their customers to love them always win the day. Think Apple. How many brands can you think of that customers absolutely love? They will defend that brand, argue on behalf of that brand; and even when that brand makes mistakes those customers are forgiving, even make up excuses for the brand.Love makes customers have deep wells of patience for brand missteps. We have seen this in the case of some athletic brands or gear. Now winning a customer over with that much love might be super difficult for other brands, but not impossible. However, if what customers have settled for is a connection, as an alternative to love, they are more likely to have a take it or leave it attitude and so brand loyalty is likely to be weaker. So all brands should always work to keep the connection strong even where there is no love connection! In life people seek certainty. Certainty is about knowing what you can count on and in the case of a brand customers like brands that will deliver the promise they state. Knowing that an order will arrive on time is a kind of certainty; certainty is what we believe we can count on, just like your best friend being there for you in time of need. Amazon built its reputation by being rigorous about meeting customer expectations. The company single-handedly created an environment of certainty that helped even reluctant customers try online shopping. When this certainty that a customer feels for a brand is violated, it disappoints the customer. This is a really big deal and winning the trust back will be a long and difficult road. With some brands there may not even be a real second chance as we saw in the Volkswagen crisis. We like surprises as human beings, surprise! Life can feel monotonous if there aren’t those moments of pleasant surprises and joyous discoveries. Whether it is a new menu item in your favorite restaurant or the new interior design at your dentist’s office, the unexpected can usually add a pleasant spike of happiness. What does this expectation of variety mean for a brand manager? This can be a the motivator for customers who try brands like the Birchbox subscription model or the Blue Apron in the food category. Or the surprise can be delivered as a personalize message from the CEO to a customer who isn’t expecting a busy CEO to take the time to write a note or take their call. Seasonal variations can be a great way to deliver variety as we see with the Starbucks flavors round the year. If a brand chooses to address this human need, they can find small but significant ways to make sure that the brand does not seem boring or tired. This is huge, a need for each of us to feel like we are meaningful, dare I say even important. A marketing manager has to understand the need for the customer to feel like they matter. When customer preferences are addressed and they feel important, that means that the brand messaging is speaking to them. If you can make each customer feel special that is the mark of a truly successful campaign. While we all intellectually understand that a business does not revolve around individual customer needs, it will be great to make each customer feel that way. Perhaps more importantly, no customer should feel that they are taken for granted; a forgone conclusion to just check off the box as an automatic customer/client. Customers want to feel that their business matters to the entrepreneur. Tony Robbins says, one cannot be stagnant, without growth we die as human beings. Many of us thrive on growth, constantly learning, studying, testing things on a personal and professional level. Customers feel that same way as they want to be part of something that is bigger than themselves; they want to evolve with the brand. They want to feel that as the brand goes through its evolution or revolution, they were participating in the process. Brands that ask for input from customers in terms of product modifications of customer service feedback, can make the people feel included in the cycle of growth. Contribution is in a sense an extension of the idea of growth. In the context of branding I see it as the belonging that can come from being part of a community, an online forum or a class. It’s about having a voice in the process and contributing knowledge/insights/ thoughts. When brands are actively having conversations with the customers and there is an interchange of ideas that can address the human need for love/connection, significance and growth. Social media channels such as Twitter, Facebook and Instagram have been used beautifully by many brands to make customers feel included. I hope that this has given online marketers some food for thought. By understanding these six human needs, how can you as a marketer win the hearts and mind of your customers? What can you or your company do to appeal to these six human needs in an authentic way to grow your organization as well as enrich the lives of your customers? I cannot over-emphasize the word authentic because the idea here is to make meaningful connections with customers. Gimmicky or manipulative strategies can backfire and reduce your brand value. Growth: Is it for your Business?